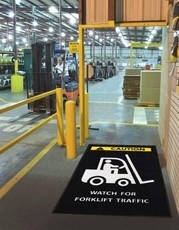 Safety Message Floor Mats MyWhiteboards.com has a full line of excellent safety message floor mats to add to your safety program. 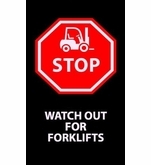 Keep your safety message fresh and always in the forefront of everyone's mind with our complete line of safety message mats. 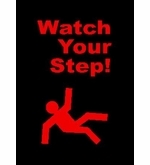 Available with a number of different safety messages with anything as simple as one of our most popular mats that reminds employees or visitors to "Watch Your Step" or a safety reminder mat such as "Safety Starts Here". Each mat is made in the U.S.A. and available in either a 3' x 5' format or a slightly larger 4' x 6' format. The facing is a 24 oz. nylon on a 70 mil thick Black PVC Backing with a 5/8" wide black border. 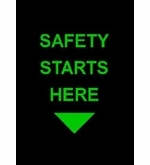 Our colorful safety message mats are the perfect compliment to any safety program especially if you add one or more of our OptiPrint® safety tracking boards to your order. 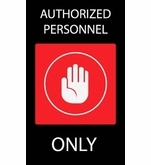 Where to use: Safety message mats should be used indoors at plant and employee entrances, lobbies, foyers, or any other light to heavy traffic areas where your safety message should be seen. "Watch Your Step" Floor mats. 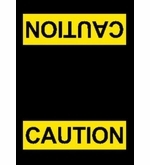 From "Select Mat Size" "305: 3' x 5' (+$99.95)" "406: 4' x 6' (+$164.95)"
"Safety Starts Here" Floor mats. 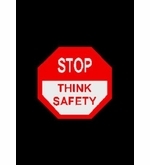 "Stop Think Safety" Floor mats.